« Send eCards on a Specific Date! 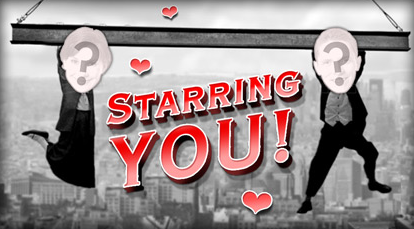 Let JibJab be Your Valentine! We’ve just launched a PLETHORA of ridiculously awesome content onto the site and we can’t help but share! If you’re looking for an amazing personalized experience to send to a loved one this Valentine’s Day, look no further than our Starring You pieces! From our new Silent Film Starring You!, to our hilariously raunchy Chippendales Dances, right on through our awkward stripteases, you’ll find something perfect for your Valentine in no time! Any way you see the holiday, let us help you express it! This entry was written by paulhanges and posted on February 4, 2009 at 2:56 pm and filed under General, Uncategorized. Bookmark the permalink. Follow any comments here with the RSS feed for this post. Post a comment or leave a trackback: Trackback URL.